V Slit Tubing from Heyco-Flex - Bolt Products Inc.
Thirteen sizes 1/8 to 1 1/2". Slit design allows side entry and encirclement of pre-assembled harnesses and capillary tubes. All nylon construction resists salt water, weak acids, gasoline, alcohol, oil, grease, and common solvents. 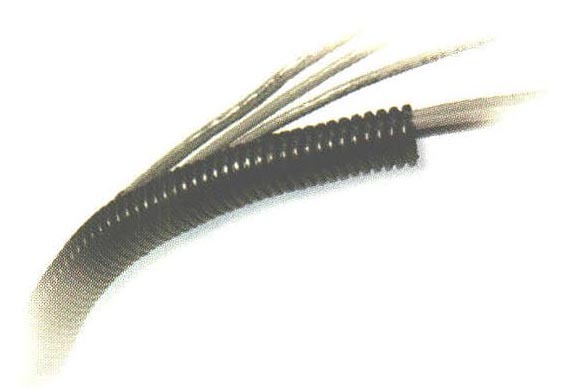 Heyco-Flex V is lightweight and flexible, yet durable enough to meet your wire management requirements. Unique slit design allows for wire breakouts. Quick installation; cuts with utility knife, PVC cutter or Heyco cutting tool #8340. Consult Heyco for slit tubing cut to length. Material : Polyamide 6 “Nylon” .